rob is here visiting me, so i've been teaching him important survival skills to distinguish himself from other tourists, such as the proper technique for glaring at pedestrians who get in your way on the bike baths. actually, rob is still (re)learning how to ride his bike, since it's been a good twenty years since he last rode one. it's totally amusing to watch. on Saturday, we went to the nearby city of Leiden with some friends to check out the festivities that the city puts on every year to celebrate the end of the seige that the Spanish had imposed on the city, several centuries ago. yes, i do realize the irony of taking your Spanish friends to a festival celebrating the end of Spanish oppression, but we're all friends in the EU now, right? the city had pretty much been converted into a giant party. 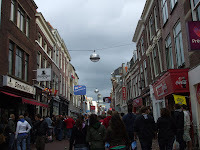 we walked around downtown for the entire day, expecting to hit a quiet street at the fringe of the festivities, but the party seemed to stretch on forever. it was unbelievably crowded. 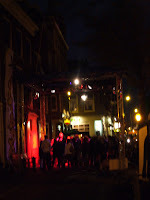 everywhere there were deejays spinning electronic music and bands performing on makeshift stages, spontaneous dance floors, dozens of food stands offering traditional dutch fare like krokets, baked pastries, and hutspot. oh, and carnival rides! nobody would go on the rollercoaster rides with me. 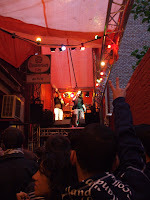 feeling overwhelmed by the crowd, we ducked into an alley, only to find a dutch band playing a show there on a raised stage. we had a beer and resigned ourselves to the fact that we were going to have to deal with a million elbows and knees pressed up against us all day. it was a pretty cool concert venue, actually. by the time rob and i started back for the train station, the night street parties had kicked off as the young people turned up, and the streets became a vast sea of electronica beats, sweaty bodies and endless garbage. sort of like Canada Day in Ottawa, only with more techno. next time we'll have to stay longer. my life in google street view! bring on the rain, mutha nature!